NCRI - The Iranian regime new envoy to the United Nations has been a member of the group that took over US embassy in Iran and held 52 Americans hostage in for 444 days. The Iranian state-run Mehr news agency(16 March) quoted a knowledgeable source of Hamas that Khaled Mashal, head of the Hamas political bureau, is planning to visit Tehran in the near future. This source also reported discussions between many senior Hamas leaders with Iranian officials about this visit by Mashal. NCRI- Former İstanbul Police Department intelligence bureau chief Ali Fuat Yılmazer has said Iran-linked notorious terrorist organization Tawhid-Salam is “the stealthiest and the most dangerous terrorist organization of recent times” Turkey has ever faced.He lamented that a painstakingly difficult three-year-long investigation into Iran-backed terrorist organization Tawhid-Salam has been foiled and ridiculed by some government officials, leading most suspects to flee the country. NCRI- Royal Dutch Shell's local unit in Cape Town, South Africa, on Tuesday refused fueling a jet carrying the visiting speaker of the Iranian regime's parliament. Ali Larijani was forced to cancel the next leg of a planned African tour because of a 24-hour delay when his plane was not refueled at Cape Town International Airport. NCRI-The Iranian regime's Supreme Leader named the new Iranian year “The Year of Economy and Culture with National Determination and Jihadi Management”. 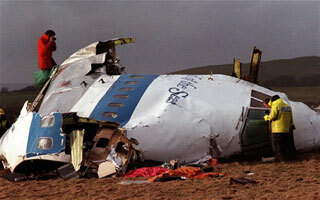 Source: telegraph.co.uk-A new documentary by Qatari broadcaster Al Jazeera claims the 1988 Lockerbie bombing was the work of Iran, following the shooting-down of an Iran Air flight six months earlier by a US Navy warship.